Real-time offers - be it products on hand, conditional promotions or free shipping to save a sale - require the capability of knowing your customers. This involves leveraging consumer segmentation data to provide targeted recommendations and customer service to create a more personalized shopping experience. TigerGraph fulfills the needs of eCommerce by providing Deep Link Analytics, enabling customer intelligence in real time, along with powerful relationship analysis. With these real-time capabilities, eCommerce enterprises can quickly synthesize and make sense of customer behavior. 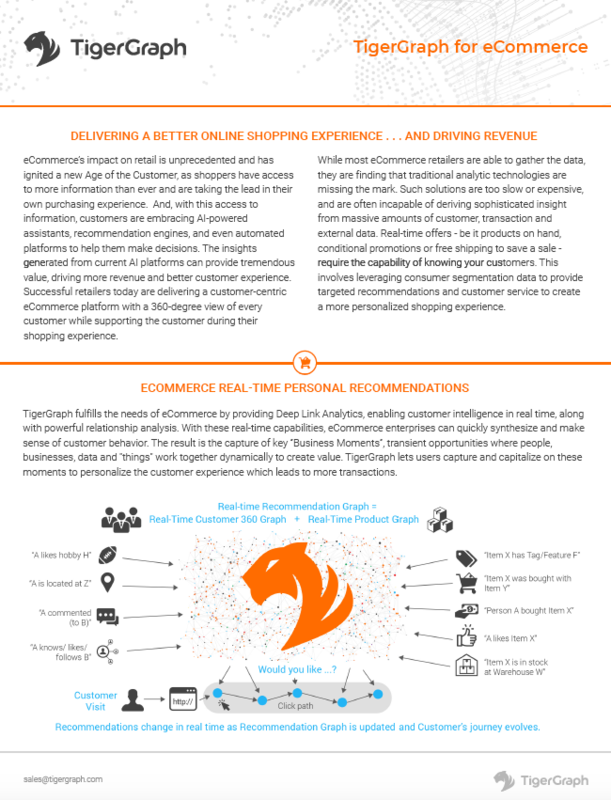 Download the solution brief to learn why TigerGraph is used by the world’s leading eCommerce companies.